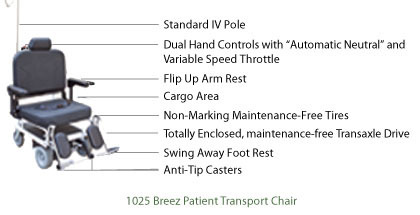 The BREEZ 1025 and 1025-G Patient Chair Transport products safely and comfortably provide motorized wheelchair transport to patients and mobility impaired individuals while eliminating the excessive push/pull forces for caregivers that lead to musculoskeletal injuries. This chair transport product can be maneuvered through tight or crowded hallways, elevators and rooms while safely transporting patients up to 750 pounds. Seat widths up to 30 inches wide make the BREEZ an excellent ergonomic solution for transporting bariatric patients. Custom seat configurations are available including a 22 inch wide version for smaller doorways, shoulder harness configurations, fabric materials and colors. The ergonomic design, power drive system and controls, make it easy for the caregiver to drive and maneuver throughout any facility. Unable to view the video? Click here to download it to your computer.